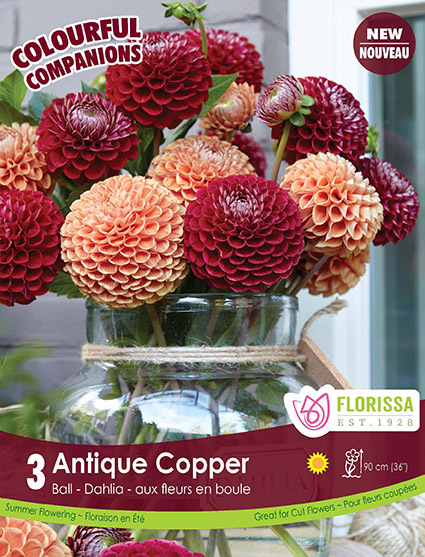 A vintage combination of breathtaking ball dahlias in warm coppery apricot and deep garnet red tones is just what you need to usher in the gardening season. Antique Copper is Florissa’s must-have Choice for 2019. This Colourful Companion features 10 cm (4”) blooms, atop strong stems which will give you outstanding and long-lasting cut flowers. The showy garnet red and warm coppery apricot tones fuse beautifully together and harmonize well with so many other flower and foliage choices. You’ll want to add them to all your floral arrangements throughout the summer and fall. Antique Copper grows to 90 cm (36”) in height. Amazing blooms from Summer through Fall! Dahlias flower for months, starting in mid-summer and continuously bloom until fall’s first hard frost. Their dazzling and vibrant blooms enliven the garden wherever you grow them – in the mixed border, the cutting garden, or window boxes and containers on the patio balcony. Available in a wide array of colours, shapes and sizes, dahlia blooms can be as small as 5 cm (2”) across and as large as 30 cm (12”) – spilling over the edge of a dinnerplate. Plants can grow as low as 30 cm (12”) and reach heights up to 120 cm (4’) tall. Dahlias are easily grown in average, well-draining soils, and enjoy full sun. Water them on a regular basis; a deep thorough watering twice a week is better than a daily light watering. 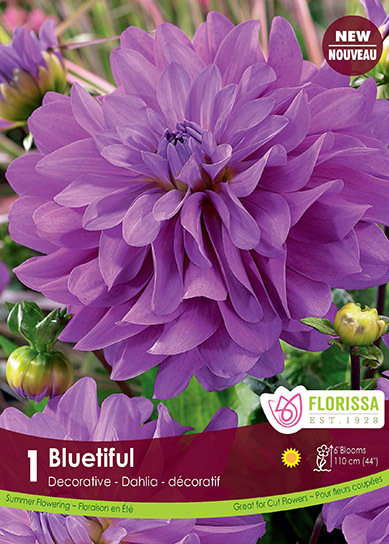 Dahlia Bluetiful will steal your heart with its gorgeous lilac-blue blooms – a new shade that is as blue as you can get in a flower. Beautiful, flowing, ruffled 15 cm (6”) blooms on long, strong stems are romantic, perfect for cutting and giving in a bouquet. Dahlias are prolific bloomers. The more you enjoy the cut flowers, the more dahlias will bloom for you. Grows to 110 cm (44”) tall. Dreaming of blooms as big and round as the full moon? 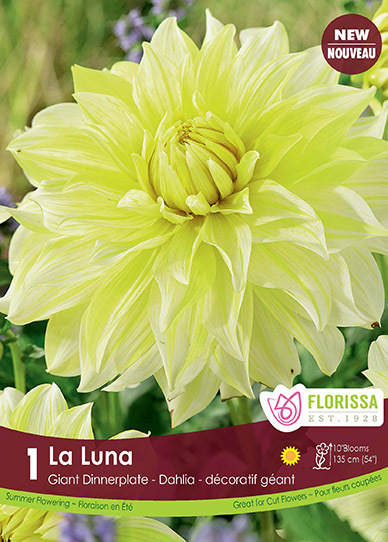 Dahlia La Luna enchants with huge, magnificent 25 cm (10”) blooms in moonlight white with luscious pale-yellow flames. If you’ve ever wanted to capture the moon in your hands, now is your chance. Captivating in cut flower bouquets and glowing in the garden at any time of day, La Luna grows 135 cm (54”) tall. Rock your summer celebrations with these, 12 cm (4.5”) deep ruby red blooms. Each silky curvy petal is tipped sparkling white, giving the overall appearance of festive fireworks. 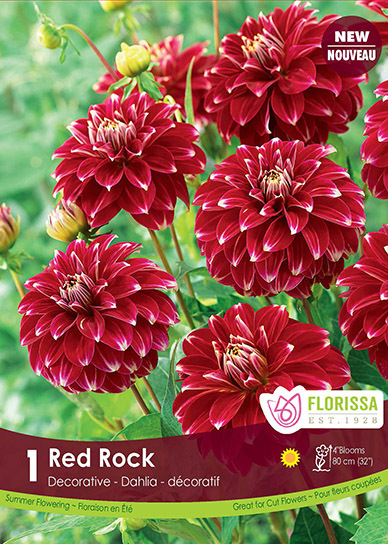 A gorgeous decorative dahlia, Red Rock grows to 80 cm (32”) tall. Ideal for the front of the mixed border or large containers on the deck. Get a jump on the season and start the tubers now in pots and grow them indoors. You can protect the tender young plants from fluctuating spring temperatures indoors. Once all danger of frost has passed and the soil temperature has warmed, you can move the plants outdoors, then you will be well on your way to those first summer blooms.